One of the tiniest of the best pocket binoculars in the world is Leica's ultra small, ultra light, ultra bright Compact Ultravid. 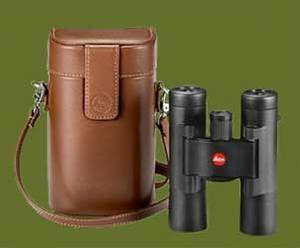 The 8x20 BCR (rubber armored) model, shown at right, has been our best-selling top-quality compact binocular for several years. It weighs in at just 9 ounces. It's less than 4 inches long. Optically, it is superbly sharp, and it is amazingly bright for such a tiny instrument. We found that the 8x20 has adequate eye relief, which means that even a person wearing glasses can see the full field of view. Of course, the binocular also works great for a person who does not wear glasses. Just pull out the eyecups to their extended position. The diopter adjustment locks. It's beautiful in and of itself. It's a joy to use something so beautifully engineered. 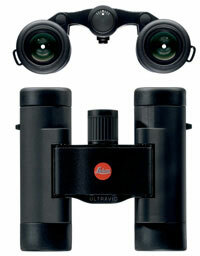 The whole binocular is put together with the famous Leica attention to detail. It folds up into a tiny, neat packet that will literally fit in almost any pocket. Some people want that extra bit of magnification and prefer the 10-power model. And if you don't wear eyeglasses, it may be just right for you. The leather versions include a high-quality leather carry case. At right is the 10x25 version, in leather, showing the leather case that comes with it. All the Compact Ultravids are completely waterproof.